Joyous Diwali wishes from the EC to all of you. May everyone's lives be filled with light and happiness! 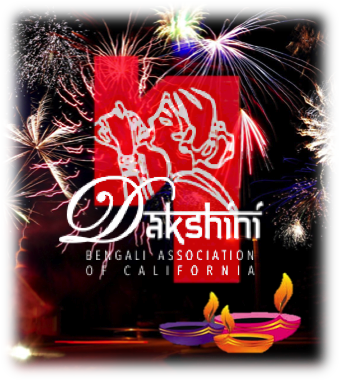 Our Puja season ended on 10/31 with Laxmi Puja. Bhoomi o Baul's performance was enjoyable and they truly soulfully connected with the audience. The food prepared by the Food Committee was excellent and we'd like to extend our sincere gratitude to Latika & Kisholoy Goswami as they graciously sponsored the food. Thank you Latika di & Kisholoy da for your awesome support as always! 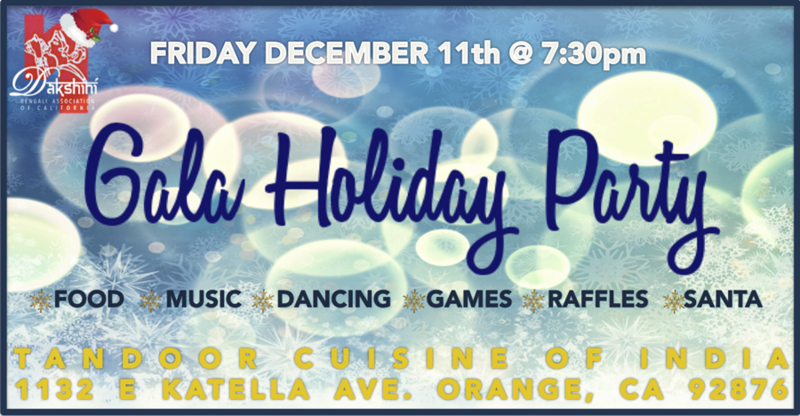 The Holiday season continues and we'd like to announce that our Gala Holiday Party will be held: Friday December 11th (7:30pm-11:30pm) at Tandoor Cuisine of India (1132 E Katella Ave. Orange, CA 92867). The restaurant has a certain capacity and seat reservation is a must! This event is free for annual members and silver/gold/platinum sponsors so the priority seat reservation will be for members and sponsors. Based on their RSVP up to a certain deadline, we will accordingly open up the party for non-members. The RSVP request will be sent out later this week.